All drivers working ok on both sets. Trending at $444.33eBay determines this price through a machine learned model of the product's sale prices within the last 90 days. Frequency response and sensitivity specs conform to Dolby Atmos specifications. ebony vinyl finish with scratch-resistant design. 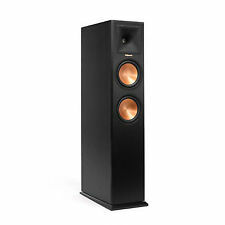 can also be used as standard left- or right-channel surround speakers when mounted to the wall. A single rotary switch for the 8-ohm bypass and multi-tap setting is conveniently located under the speaker grille. Includes tile bridge for installation in any ceiling. A new, more compact design simpli es low ceiling mounting. A Linear Travel Suspension minimizes distortion for enhanced, detailed performance. When paired with the Tractrix Horn-loaded LTS tweeter, it provides speaker efficiency highest in its class. Detailed 1" aluminum Linear Travel Suspension horn-loaded tweeter. We keep a smaller portion of each sale. Serial # : RB5BS-0130 0094 RB5BS-0130 0093. Anything else not listed or photographed. They are missing the grills. ( see pictures ). 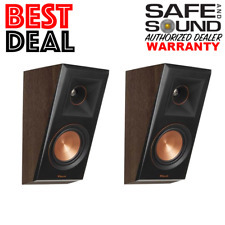 This speaker is in excellent condition- general wear is to be expected. Utilizing proprietary Tractrix® Horn technology for unmatched clarity and detail and a premium, long-throw woofer the sound is rich and dynamic well beyond its compact size. WOOFER: 5.25" (13.3cm) long-throw IMG woofer. Enclosure Type ABS/Infinite Baffle. Mounting Depth 4.45” (11.3cm). 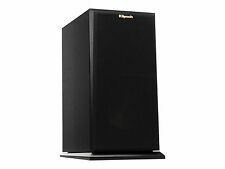 Klipsch R-10SW Passive Subwoofer. Shipped with USPS Parcel Select Ground. 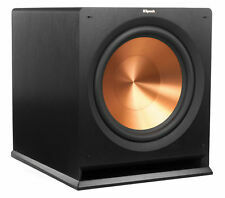 Powerful 10" copper-spun front-firing woofer. Spun Copper IMG Woofer. SUBWOOFER IS STILL LIKE NEW BOUGHT IT APRIL 13 ,2017 NEVER USE A LOT BECAUSE NEIGHBOR COMPLAINS TOO MUCH LOUD NOISE. All-Digital Amplifier. High power handling. Flat, magnetic paintable steel grille fits any decor. I HAVE TWO PASSIVE RADDIATORS BUT THE PRICE IS FOR ONE ONLY. BOTH OF THEM WORK PROPERLY, NO ISSUES AT ALL. IN THE VERY RARE EVENT THAT AN ITEM ARRIVES NOT AS. DESCRIBED IN OUR ADS, WE WILL RESOLVE THE ISSUE(S) WITH. 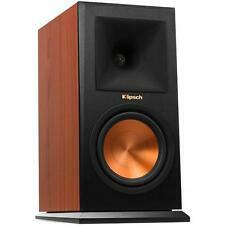 You will receive: Klipsch RW-5802II White In-Wall Subwoofer. guaranteed to work correctly, full factory warranty. Bookshelf Speakers. A Linear Travel Suspension minimizes distortion for enhanced, detailed performance. When paired with the Tractrix Horn-loaded LTS tweeter, it provides speaker efficiency highest in its class. A Linear Travel Suspension minimizes distortion for enhanced, detailed performance. Bookshelf speaker pair. High Frequency Driver: 1" Titanium LTS Tweeter with Hybrid Cross–Section Tractrix Horn. Special TV Instructions. The subwoofer features two strong-yet-light 8" woofers designed for tight, precise bass. paintable bezel and rustproof aluminum grille. 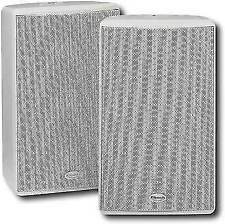 two 8" woofers. mounting depth: 3-3/4". 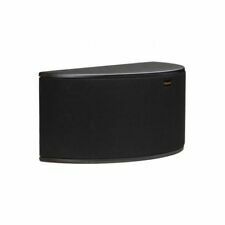 cutout: 10-1/8"W x 19-1/8"H.
Set this height channel on top of your existing floorstanding speaker to complete a hemisphere of rich, detailed sound. Adds Dolby Atmos® experience to any floorstanding/bookshelf speaker. 3/4" Linear Travel Suspension Aluminum Tweeter. And because it's so efficient, you get much more sound per watt, enabling this full-range model to work well in wide-open spaces. Crossover Frequency: 2450Hz. Nominal Impedance: 8 ohms. A beefy 8" IMG (injection-molded graphite) woofer with a rubber surround provides the mids and bass, for full-range sound in outdoor spaces. 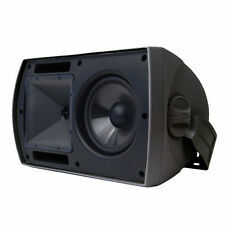 8" IMG (injection-molded graphite) woofer with rubber surround. Speaker still unused. Includes ; speaker grill. The Reference Premiere RP-160M monitors provide bold, theater-quality sound in a compact, bookshelf speaker – making them easy to place in almost any room layout. Also Available In Ebony. 1" Linear Travel Suspension Titanium Tweeter. When paired with the Tractrix Horn-loaded LTS tweeter, it provide. A Linear Travel Suspension minimizes distortion for enhanced, detailed performance. If your item has already left the warehouse, we cannot match any reduced pricing.